The Mormon Church has every right to build temples according to any design and for any purpose it pleases, but here’s the problem. 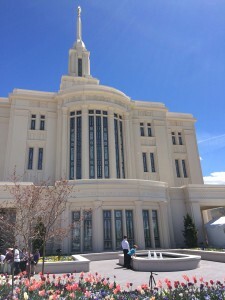 The Church proclaims that Mormon temples are “patterned after” Solomon’s temple, and that Mormon temples are a restoration of ancient biblical temples, built for the performance of biblical ordinances. These assertions are completely untrue. And considering the fact that every detail of the biblical temple is clearly presented in the Bible, the Mormon Church knows its assertions are untrue. Which means the Church is willfully deceiving people about Mormon temples. And so I believe these temples accomplish the opposite of the claim made by Kent Richards. Mormon temples do not “honor the Lord”; they dishonor the Lord through deception. This entry was posted in LDS Church, Mormon Temple and tagged Atonement, Baptism for the Dead, Christianity, Church of Jesus Christ of Latter-day Saints, Endowment, Eternal Marriage, Jesus Christ, Mormon Church, Mormon Marriage, Mormon Temples, Payson Temple, Solomon's Temple. Bookmark the permalink. And temples are just the tip of the iceberg when it comes to Mormon claims that their restoration follows Biblical patterns. Modern LDS church organization is not patterned after first (or second, or third) century Christian church organization. Priesthood leadership organization is not patterned after New Testament notions of either priesthood or leadership organization. Missionary work does not follow any Biblical pattern. The Book of Mormon is not like the Bible. The role of prophets in the Mormon church is not the same as the role prophets took/had in the Old Testament. The role of apostles is not the same–there is no real discernible correlation between the ancient apostles and the current batch. There is more, but you get the picture. Mormonism restored nothing. Indeed, there was absolutely no need for a restoration in the first place. The LDS church is being deceptive regarding their temples being patterned after the Jewish temple? I simply can’t believe this. The leaders of the “one true church” would deceive people? OOPS! There has to be some Mormon clause that can be invoked here so that it can all be explained. How about progressive revelation? Will that cover it? As all who follow my comments on MC know, this idea of first century Christian temples is one of my main hobby horses. I notice that the reference is to temples in Biblical times. I’m guessing that means the OT. Perhaps that’s the escape clause that can be invoked. But wait a minute. Isn’t the modern day LDS church claiming that they have restored all of the things that were lost after the death of the apostles? Not only has Mormonism restored Christian temples and all of the rituals that first century Christians performed in these Christian temples, but the lost priesthood has also been restored. Smith claimed that John the Baptist appeared to him for the purpose of the priesthood restoration, but I don’t know who exactly appeared to Smith and restored the temples. He even had an angel with a sword appear to him telling him he’d kill (Smith) if polygamy wasn’t restored; at least that was the line Smith used to seduce one of the women he claimed as a wife. So, how many Christian temples were built before the apostles died? Did the Christians just use the Jewish temple in Jerusalem? Are the rituals practiced in the modern day restored LDS church the same rituals performed by the Jews in their temple? I must admit to getting slightly frustrated and agitated at the total stupidity that forms the basis of LDS claims. When push-comes-to-shove, the LDS have to come up with conspiracy theories to make it all work. It’s one big game of “let’s pretend”. Broken record here! Why don’t Mormons take about two minutes, real time, and do a google search regarding the Jewish temples. Here was my question entered in the search bar: “How many Jewish Temples were there?” Here’s just a small portion of the information I found. Now how difficult is that? But here’s the problem. Evidence and facts mean absolutely nothing to a true believer. They will always find a way to invent information to fit their predetermined narrative. All they know is that they read the BoM, it created a feeling in them, the feeling is interpreted as a sign from God that everything Mormon is true (not just the BoM) and off to the races they go. 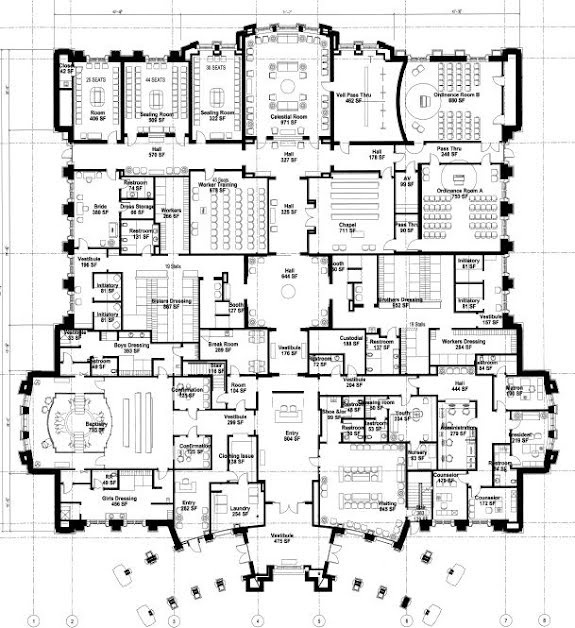 Although Mormons are very proud of their temples, there’s one thing they will be reluctant to mention: all those “sealing rooms” are used for joining both living and deceased Mormons into polygamous marriages with living and deceased persons. For example, a widower might be sealed in a polygamous marriage to a new living bride. This polygamous union will be realized in the next life. Or living Mormons may perform vicarious polygamous marriages for deceased persons, uniting one man to several women in the hereafter. These polygamous marriages occur frequently in the temples today. When Mormons claim that their church abandoned polygamy in 1904 — they used to claim it happened in 1890, but it turns out that was just a charade by church leaders — Mormons are discreetly sidestepping the fact that they are actively performing polygamous marriages that will become effective in the next life. Sharon, have you prayed about this yet? Because if you pray about this with your whole heart doubting nothing then the Holy Ghost will reveal to you that modern temples are truly patterned after Solomon’s temple. Why would you place your faith in the things that men claim to be true? Shouldn’t you rather trust the Holy Ghost when he reveals to you that the Church is true? Proverbs 3:5. Tom, you were spot on with your comment . ” The church of Christ — which is called the Church of Jesus Christ of Latter Day Saints — has been organized as we testify according to THE ORIGINAL PATTERN , with apostles , prophets , with Evangelists , and teachers and the various offices that were contained in the ancient church , having all the essential features of the primitive church . But not this alone . The gospel as taught is claimed to be the same gospel in every particular as was preached by the Savior while upon the earth and committed by Him to His apostles to declare to all nations the same doctrine , the same ordinances , same gifts and same blessings .” [ Pres. George Q. Cannon 1881 , JofD v 22 p. 359 ] . It seems that Kent Richard and apostle Petersen used that same tactic in trying to convince their audience about the Mormon temple compared to Solomon’s temple . However , as Sharon has shown the Mormon temple has not been patterned after the Jewish temple in Biblical days in any important way . And Mormons do not believe they are being deceitful when they describe the function of their temples. This Mormon belief that their temples perform the same function as the ancient Jewish temples is not based in a desire to deceive anyone. It’s simply based in ignorance. I would agree with you that Mormons do not believe they are being purposely deceptive when they describe their temples as ” following the pattern of Biblical days ….” . However , I think that using statements like that will end up being deceptive to those who take them at face value whether the intent was on purpose or not . Full disclose is important in ” selling” one’s claims . I think a good example of this is how there is a statue of Joseph Smith and Emma in Temple square . It’s designed to show the virtue of Smith as a devoted husband etc . But is it deceptive when the other dozens of his wives are absent from being depicted there with him also ? I think so . Many Mormons themselves have been stunned in recent years to discover Smith was a polygamist . On many fronts in public venues I think Mormon leaders or their P.R. Dept could be more consistent with full disclosure . Is the ignorance that of Mike and Molly Mormon or of the leadership? See this is what bothers me about this idea of whether or not Mormons are being deceitful. The information is readily available and knowable. Two minutes and a google search would get someone the information. I would agree people are ignorant when it comes to all sorts of information related to religion but it’s not that difficult to access the information and evaluate it. There’s a culture in Mormonism that leads to the membership being woefully ignorant. It’s a cult set-up where by the leaders have put deep fear into the people regarding looking into things that won’t promote the sect in a positive light. Sharon again has done a phenomenal job. “Do you not know that you are God’s temple and that God’s Spirit dwells in you? This all took place 40 years before AD 70, which places this at the time Jesus died. Why then do we need a temple today? Why then do we need a Levitical priesthood today? Only Christ is the answer. Not a religion or a church; there’s no harm in joining one that subscribes to the Christianity of the scriptures. Very simple answer to your question/s. It’s because Mormonism, regardless of the sect, is a concoction of ideas that bear no resemblance to actual historical fact or orthodox Christian doctrine. Joseph Smith and those he was associated with were basically “blue sky” religious entrepreneurs. The reason that LDS doctrine is such a mess is because the religion can’t separate fact from fiction even within the confines of it’s own sect. They just sort of make it up as they go along, call it progressive revelation and excuse the real nutty stuff which was seen as true blue at the time, as folk doctrine or the mere opinion of the prophet. Just for fun, I’d encourage the rank-and-file LDS member do a compare and contrast exercise with the various sects of Mormonism. They all believe they have a prophet and the real deal restoration. I especially get a kick out of video presentations by FLDS folks. Even within that universe you will see a lot of variation. But true to form, they all follow that time honored Mormon tradition of free flow of thought. They truly are waves tossed here and there by wild winds, gushing up foam. All the commenters have pretty much figured it out. I’ve discussed the temple with many LDS and they all say the same thing. They will explain that most of the temple ordinances, like baptism for the dead, the endowment, the temple clothing, and the rituals, are revealed from God and are the same as those rituals performed in the temples anciently. As for polygamous marriages, they will concede that may be a minor embellishment directed by God in these latter days. They will explain that the Bible doesn’t go into detail on this because (1) the rites were sacred and secret; and (2) anything in the Bible affirming the LDS position has been removed from the Bible by those pesky early Christians, that evil Constantine, and all those deceitful early Catholics. And as for you nitpicking evangelicals, the Mormons would continue, your ancestors were probably the first to join that “scissors party” with the rest of them, snipping out the “many plain and precious things.” This all becomes clear when you realize that “the [Bible] hath gone forth through the hands of the great and abominable church….” Book of Mormon,1 Nephi 13:28. By the way, don’t start feeling smug that the G&A (as LDS refer to the Great and Abominable Church of the Devil) is the Catholic Church. Today’s Mormons are much more ecumenical and will gladly include traditional Christians — that means you — in the G&A, which in Mormonspeak means all those who are against God and who fight against Zion, in all periods of time (also known as the “whore of all the earth.” … You’re welcome. …) (2 Ne. 10:16). So, you see, if historians today can’t find anything about LDS temple rituals in the Bible, it’s your fault. Again, you’re welcome. Absolutely. And that’s the fun of Mormonism. Just haul out the conspiracy theories and stuff revealed directly from God and anything and everything works. It’s truly a fly-by-the-seat-of-your-pants religion. Bottom line? How does it make you feel. If you feel good about it, that’s the Mormon god revealing it personally to you. Not to pick on some of my Evangelical and/or Pentecostal friends, but there’s a lot of that sort of thing that goes on even in denominations who have an orthodox view of doctrine. Some folks just really enjoy feeling things and connecting dots as they attempt to see God working in their lives. Most of it is fairly harmless, working right up to the toes at the line, without crossing over. Folks in the modern day prophetic movement are real practitioners of this type of deal. Now this is coming from someone (me) who is more inclined towards the personal revelatory experience as presented in First Corinthians 12, 13 and 14; hopefully seasoned with maturity and wisdom. You know that LDS doctrinal all-star Bruce McConkie got into some trouble referring to the Catholic Church as the “whore of Babylon”. I believe it was in his book “Mormon Doctrine” which the LDS church will no longer claim or publish. This was the tome that generations of LDS faithful depended on for instruction. He was also said to be the “go to guy” for the LDS leadership to go to on manners of doctrine. Anyway, my understanding is that the Catholic Bishop in SLC got on the horn to the then LDS prophet and asked him about this assertion by McConkie. As you can imagine, there was a lot of back peddling. Although McKay had privately agreed with McConkie about Catholicism, the embarrassment over the book’s statements caused him to evaluate and relax his criticisms and foster cooperation with the Catholic Church. You’ve pointed out another curious fact about the LDS: although they are strict in enforcing their doctrines, it seems those doctrines change slightly every ten years or so. And once the doctrines change, nobody refers to the previous doctrine that was perfectly orthodox just a few years previous. Thus, it is very important for the LDS to keep current on their doctrines. Heaven forbid an unsuspecting Mormon should keep espousing a doctrine (like the Adam-God doctrine, polygamy, or denial of the priesthood to African Americans) after its been abandoned. In fact, I wouldn’t be surprised if within a few years LDS leadership disavows all those statements about LDS temples and temple ceremonies being the same as those practiced by the early Christians. “I knew that”, I’m really smart and super spiritual after all I’m a priesthood holder. “a long time ago”, you just get to the party fella…..this is old news….you need to get up to speed………..it’s meaningless information from the past. “hasn’t effected my testimony”, I’m rock solid in the primacy of the LDS church it being the one true church. What’s odd is the anger expressed(by LDS faithful) when I ask why the LDS church practices doctrines that are clearly opposed or fail to meet the the legal requirements of Temple. The funny part is I should be the one getting upset that I’ve fed a pack of lies each time a MM tries to convince me the fermented lie package known as the LDS gospel. The LDS gospel bears a double trap. You’re trapped if you believe, and if you as an LDS Member disbelieve/question the foundation of the LDS faith, then you may lose your faith in the Christ of the Bible (From the nonsense you have learned from the LDS Faith). I’ve heard in person, LDS members confessing having lost faith in true Christianity because their foundation is shattered after realizing their faith(as originally taught by the LDS Church) is based on a construction of sand. Rikki– that is precisely why I see Mormonism as a dangerous and real threat to Christianity. 1. They enjoy bathing their babies in very dirty bath water and don’t seem to notice or care. 2. When they finally realize what they’ve been doing and find the courage to change, they tend to throw the baby out with the bath water. Even though Mormonism is a tough sell and despite the fact that the LDS sect is hemoraging members, it’s important that we keep fighting this spiritual battle against the forces of darkness in the heavenly places. I don’t see the Mormon people as the enemy but I do see the spirit behind Mormonism as a stronghold that needs to be confronted and defeated. The apostle Paul rightly said that our battle is not against flesh and blood. In a way, the Mormon people are a pathetic lot. They put all they have into this false religion and the system beats them (metaphorically speaking) like a borrowed mule. The key factor in Christianity is the Lord Jesus Christ. A person doesn’t need some religious system to attain for them eternal life. Being with the Father for eternity depends on our acceptance of His plan of salvation which is contained in His Son Jesus Christ. There are no rites or rituals that will save or guarantee anyone eternal life. Our behavior doesn’t even guarantee us eternal life. If that were so, all good moral people with exemplary behavior would be saved apart from Jesus Christ. Placing our faith in Jesus and not some worthless works done in faux temples is the key to salvation. They don’t show you the part of the temple on the tour where you go into a stall to be dabbed in oil do they? I don’t understand why the mormons are deceitful to their own people. Before I went thru the temple no one told me anything. All I thought was it was going to be the most spiritual day of my life and I got married there. Had no idea about other things happening but just the actual marriage. Thought there would be pictures of Christ everywhere and we would sing hymns or hear a talk. I really had no idea about anything! Yes I knew there was a temple packet but I wasn’t even allowed to look inside or see. I also found out I couldn’t try on garments and had no idea I had to wear them every day till after I went thru. (Yes my parents wore them but I thought it was just a personal choice they made or something) Had no idea I had to keep a bunch of promises. I don’t understand why before you don’t need protection from evil spirits needing a garment but after you do. I don’t know why they won’t be honest and tell you what you are promising before.. That to me is wrong! Exactly like this article said. An awful lot of LDS have similar problems with the temple ceremonies, the sealings and anointings. While I was LDS and assigned to fill temple assignments with volunteers from the ward, quite a number of LDS women in the ward told me they found the temple ceremonies, particularly the anointings, to be humiliating and embarrassing. They said they were never going back again to do vicarious work for the dead. They were very nice about it, but they were genuinely distressed by the whole thing. for divulging the secret name and tokens received was dropped ) . No I went thru when I was 18 in 2002. What stands out to me the most about this post and all the discussions is what usually does for me about Mormonism: the LDS church likes to explain their differences by saying “God revealed it” or that it’s not in the Bible “because it was lost” which in both instances aren’t things that are easy to argue against? Because there’s no tangible proof. Like the Book of Mormon, etc. Mormons are willing to believe in anything they’re told because most of the time there isn’t something contradicting it directly so it can be “lost” (but hopefully just never found, right?). SR Sorry I just saw your comment and never looked at comments earlier last time I was here at Mormon Coffee. I am still mormon on the books but I don’t believe it anymore. I have been reading Mormon Coffee or visiting off and on for years. My husband is still a TBM. Yes what you say all makes sense.